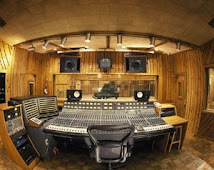 QUESTION: Besides the space, why record at a professional studio that's been around? ANSWER: Last time, I talked about room rates. Let's examine what you get for the dollars you pay. I've heard many people say that a studio has a soul and I have to agree. I know that our studio was built with the following - dreams of riches, technical ambition, swagger, maybe a pinch of defiance. However, it was sustained through the years by a lot of sweat, perseverance and care. Every person who toiled at the studio contributed something along the way. It is a truly a temple where a lot of people aspired to practice the art of making and preserving music. If a studio has a heart and soul, it also has a brain. A studio becomes a rich depository of knowledge through years of trial and error. What worked gets tucked away in people's minds for future reference and what didn't get passed on as stories that never die, unfortunately for the protagonists. From countless numbers of recording sessions, various "systems" are established for repeatability, efficiency and mistake avoidance. This information is called institutional knowledge, but I prefer the term tribal knowledge as used by engineer Niko Bolas. Studios with long histories, such as Abbey Road and Capitol Studios, have lots of tribal knowledge. Our own knowledge heritage is from Power Station, Media Sound and Motown Studios where Tony Bongiovi worked. This knowledge gets passed down through generations of staff as the information gets further refined. New members get trained as they get acclimated to how things are done. Some of this information have been written down, but most of the transfer happens verbally through human interactions. With the heavier emphasis on digital audio these days, the act of transferring analog knowledge invokes in my mind a scene from the movie Fahrenheit 451 where people pass on contents of books verbally because books are forbidden. As an aside, I have to say that training requires constant and concerted effort. Training a staff of twenty is a little bit harder than one-on-one mentoring. After we go through a few generations of runners and assistants, some of the information becomes "modified." It is like playing the game of telephone. We have to periodically conduct refresher courses for a reset. My point here is that we have to work at maintaining a level of consistent quality, even if we have a solid foundation in our history. Same thing can be said about maintenance. Let me illustrate with an example. Anyone can buy an analog tape machine and install it in their studio. Of course, before they do, someone has to check it out to make sure it works. If it does not work properly, it has to be fixed. Then it has to be interfaced with whatever gear is in the studio and the audio signal chain as well as sync has to be checked out. Once the machine is in working order and it is properly connected, someone has to know how to adjust the settings and what to adjust it to, e.g. bias. Knowing how to use it under normal conditions is a given - which includes the art of splicing tape. (Tony Bongiovi was a master at it and he could do it flawlessly without looking while engaging you in a heavy discussion about aerodynamics. Fortunately, he taught Roy Hendrickson and others well and passed on the skill. It may not seem like a big deal to older engineers, but you should see the reaction of younger staff members when it is demonstrated.) If there is a hiccup or a part fails, someone has to go through and troubleshoot it. If a component is "bad", a replacement part has to be located, then replaced. The machine will have to be tuned again for operations. I just listed a few steps that require an enormous amount of background information and knowledge. And that is just one machine! For us, it is worth the effort because the quality recording you get from a Studer A800 is priceless. Studios are not just a bunch of rooms with lots of gear. There is a lot going on in the background where accumulated knowledge in the form of systems, training and maintenance is being employed. So, next time you grumble about the cost of a session, keep in mind, the benefits of our tribal knowledge is included in the package free of charge. And to all those with tribal knowledge, keep passing it on to future generations!